The Conquest of Mexico in 1521 gave rise to one of the richest culinary revolutions in history. When the Spanish explorer Cortez and his followers came to the new world in search of fortune, they found a wealth of culinary specialties such as chocolate, peanuts, vanilla, beans, squash, avocados, coconuts, corn and tomatoes. In turn the Spanish brought to the Americas products such as pork, beef, lamb, citrus fruits, garlic, cheese, milk, wheat, vinegar and wine. Montezuma, the great Aztec emperor, was previously warned that one day bearded men mounted on animals like giant deer would come to take over his domain, so when Montezuma heard that men had landed at Vera Cruz he was not surprised. He made every effort to keep them in Vera Cruz by offering them great riches, but after seeing the riches it spurred them on to see where the riches came from. On November 8, 1519, Cortez entered Montezuma's capitol along with seven thousand native soldiers he had recruited along the way. He was received by Montezuma and given a great feast, but the cordial relations between the Spanish captain and the Aztec emperor were short lived. After many bloody battles, on August 13th 1521, Cortez claimed the capitol. The conquerors systematically destroyed the Aztec empire and replaced it with Spanish structures and Institutions, but they never succeeded in extinguishing the native culture and traditions, which are still part of Mexico today. The emerging Mexican cuisine was constantly being enriched from many different countries. Recipes and ingredients from Africa, South America, Caribbean, France and the orient found there way through the Spanish - Mexico conduit. A fine, and in our opinion the finest, refinement has been the creation of Tex-Mex Food. It is characterized by a cultural blend of Northern Mexico and Southwest US (southern Texas), where Native Americans, cowboys, Texans and Mexicans intermingled cultures to give us the unique culture of Texas and fine food. The cuisines of these countries were melded together into new culinary specialties and became what we now call Mexican food. This cuisine is constantly being changed by outside influences, even today. Christmas Decorations Our chili pepper decorations and our Tex Mex Christmas ornaments are here! You can start with our Tex Mex Santa and his cactus Christmas tree, Mexican chili pepper ornaments or how about a trio of western leather ornaments or just keep on browsing, you'll have as much fun as we did! Mexican Christmas Tradition In Mexico, the Christmas festivities begin nine days before Christmas, representing the period when Mary and Joseph were seeking shelter before the birth of Jesus, through January 6th, when the Three Wise Men reached the Christ Child and presented him with gifts. Las Posadas This Mexican Christmas tradition is the best known manifestation of the Christmas spirit held each night on the nine days between December 16th and Christmas eve which, according to religious tradition, represents the period when Mary and Joseph long ago search for lodgings were seeking shelter before the birth of Jesus is re-enacted. Solemn and deeply religious in feeling at first, the observances soon became imbued with a spirit of fun and eventually left the church and began to be celebrated in people's homes. The posadas have become a community affair with friends, relatives and neighbors getting together to share in the festivities, visiting a different house each evening. People carry candles, visit several houses and ask for posada(shelter), the adults are given a thick punch Ponche Navideno and at the end of the journey, the piñata;, stuffed with candy and fruit, is broken. Christmas itself is usually celebrated on Christmas eve in Mexico with a midnight mass and a late dinner. Modern influences have introduced the Christmas tree and Santa Claus along with the traditional creche. Pastorelas - This Mexican Christmas tradition refers to events prior to the birth of Jesus with the splendor of the manger and the shepherds. The pastorelas, as a scenic and literary genre, had its roots in 16th century Spanish religious theatre. These were theatrical representations used by the missionaries to impart religious knowledge to the indigenous people of Mexico. Usually performed in the afternoon or early evenings of the last weeks of December, pastorelas are a Mexican version of Europe's medieval miracle plays. They are most often presented outdoors in a public square, perhaps the courtyard of a church or an inn. The players may be local townsfolk, groups of schoolchildren, semi professional traveling troupes of actors during the Christmas season. The performance might last from half an hour to several hours to all night. Pastorela means pastoral or a play that takes place in the countryside and concerns the activities of pastores, or shepherds. It was first introduced in Mexico by missionaries in the 1500's, the pastorelas continued to grow in favor among the Mexican people and today are one of the most popular Christmastime entertainments. Mixing religious teachings with Indian Mexican folklore and ribald comedy, the pastorelas all tell pretty much the same story...the eternal conflict between good and evil. The plot revolves around the pilgrimage of the shepherds to Bethlehem to see the newborn Christ Child. Flor de Nochebuena (Christmas flower) the Poinsettia the cuetlaxochitl (Poinsettia) is known as the Christmas flower, due to its red color and because it blooms mainly in December. These beautiful red flowers, which have become a symbol of Christmas, are native to Mexico. In some countries, it is known as Poinsettia after a former US ambassador to Mexico, Joel R. Poinset. It is said that he liked the flower so much that he dedicated the last years of his life to making the poinsettia the Mexican symbol of Christmas throughout the world. Pre-Hispanic Mexicans also used the flower for medicinal purposes. The red blossoms were believed to stimulate circulation to the heart if placed on the chest and were also crushed and applied to skin infections. Pinata Without doubt, one of the merriest Mexican Christmas tradition is that of the pinata, the whimsically decorated, brightly colored, hollow figure that holds candy and other goodies and is designed expressly to be smashed to bits! The true pinata is, underneath, a large clay pot and from that base, it becomes just about anything imaginable and made of crepe or tissue paper, papier-maché, tinsel and sometimes colored paints and sequins are added which turns it into an object of sheer delight. No matter what material a piñata is made of now days, you can find them in just about any shape from angels, Santa Claus, donkeys, flowers, clowns and stars all with gaily colored streamers. 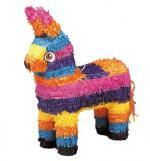 Mexico at Christmas is a dazzling spectacle, made up in great part by the incredible array of pinatas. Dia de Reyes (Epiphany) Each year, this Mexican Christmas tradition continues. The children gather at the Alameda Central Park in Mexico City to visit the Three Magi (The Three Kings) and hand-deliver letters with their wishes and gifts in the tradition of the Three Wise Men who came from the East, following the star of Bethlehem, and presenting the Christ Child with gold, incense and myrrh. The traditional Epiphany supper of ring-shaped cake with hot chocolate originated in Spain and made its way to Mexico. The cake is decorated with sugar and dried fruit. A small figure, representing the Christ Child, is hidden inside the cake. The century old tradition states that whoever finds the "Child" is spiritually obliged to present the figure at the nearest church on February 2nd and offer a tamale-party in his honor.